The first weekend of October was the second attempt of 2010 to hold the 2010 Grand Prix of Japan. The Grand Prix of Japan is the annual MotoGP race that was traditionally held in October until 2009 where it was moved to spring. It was initially supposed to be held in spring of 2010, but due to the Icelandic volcano eruption, the GP was re-scheduled to October. It was a huge disappointment at the time, but at the same time, I was extremely happy that it would return to the end of the season. If you have read any of my previous posts on past GPs, you would know that I have been to 4 previous GPs. When they moved the race up to spring, it was a tough race to enjoy relative to an end of season race. Rather than being at the end of the season where I would have had time to learn about the different riders and get a chance to recognize the liveries on each of the bikes, spring was a new season where there were no clear leaders. This year, I had no real changes to my schedule from last year’s trip. I decided to do a one night, two day trip for only the second time. I took off from Tokyo Station in the very early morning and reached Motegi Twin Ring before 11am, about 40 minutes late due to heavy traffic in Tokyo. I had a good chance to relax on the trip up and got excited as always when we reached the main entrance. Once the bus parked, I jumped out and headed straight to the track. Being a qualifying Saturday, the track was far from crowded. I had a lot of time on my hands as there was nothing set to do and the bus would leave for the hotel around 5pm. I spent most of the morning shopping around the main area. 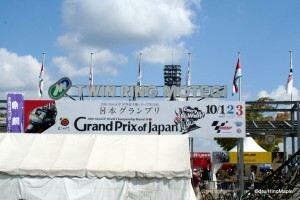 If you ever visit Twin Ring Motegi, the area behind the main grand stand is where most of the shops are held. There is an official shop located just below the main grandstands, and various temporary tents set up in the main plaza. Just past the main plaza, near Victory Corner is where most of the eateries are located, along with an area behind the VIP grandstands. 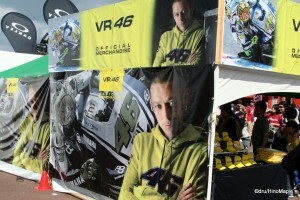 This year was unique in that there were more Valentino Rossi booths than normal. The standard booths by all the major manufacturers in the MotoGP class were also there. There were also the usual interviews with various riders. I don’t believe that Valentino Rossi was out there, but I was a little too busy watching the actual qualifying to care this year. Last year, I did take time to try to see Rossi at the interview, but that was due to the rain soaked qualifying. One of the saddest parts of this GP was the fact that Shoya Tomizawa, a rising MotoGP star had tragically died the month before. 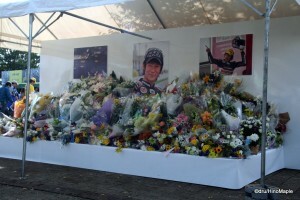 There was a special tent set up with a few pictures of Tomizawa and hundreds of flowers set up under them. Only a few places had Tomizawa shirts and the like. It was a very sad thing to see. All over, you could see his distinctive 48 all over. When I entered the grandstands, there were the usual flags promoting all of the riders, but there were also dozens, if not hundreds of flags for Shoya Tomizawa. Many had his number along with the simple words “Arigato”, or thank you. The other major flag was one showcasing Tomizawa’s personal “symbol”. It was a stylized gold “S” on a red circle. Think of it like the traditional Japanese flag but with a gold “S” on top of the red dot. Before any of the races got underway, Dorna, the commercial rights holders of MotoGP held a special ceremony where they retired Shoya Tomizawa’s number. They presented his parents with a special plaque with his number, a memorial book with messages from thousands of fans, and an award praising Tomizawa as the best Moto2 rider of the season, as elected by his peers. Tomizawa is one of the brightest personalities within the MotoGP paddock. When I watched him on TV, he was always smiling. In fact, his parents commented that he had a “mischievous” smile. It was true that his smile was mischievous, but it was also very infections. Seeing his smile always made me smile as well. I was deeply affected by his death and the MotoGP paddock will never be the same. Tomizawa will eventually live on by being memorialized in Japan. He will be remembered much the same as Daijiro Kato is remembered after his death in 2003. I’m sure that we’ll be seeing his number flown for years to come at all future Grand Prix of Japan. Getting back to a lighter note, the races had lived up to my expectations. I wasn’t expecting the best race in history, but it was still a good race. I was once again in a Yamaha supporters section. I got a bunch of free swag, and won a nice warm pull over with Fiat Yamaha emblazoned all over it. I was really hoping to win a photo book to complete my set, but I wasn’t lucky enough. 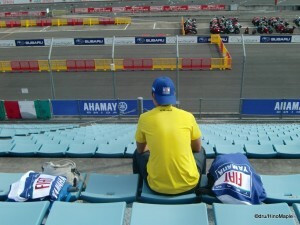 Being with the Yamaha supporters, I had to sit in the main grandstand, just off to the side of the podium. Like always, the podium was accessible from the grandstands. The 125cc and the Moto2 races were normal. There wasn’t a lot of interesting things happening in the first two races. The main points of interests were the fact that there were various Japanese riders in the races that had a chance to be on the podium. Unfortunately, they didn’t do so well, and the typical heavyweights in each class did well. For the MotoGP class itself, the show was pretty typical until the last few laps. That’s when all of the action happened. It was an amazing race and a great way to end the weekend. I left the race feeling extremely happy and satisfied with what had happened, along with a lighter wallet. 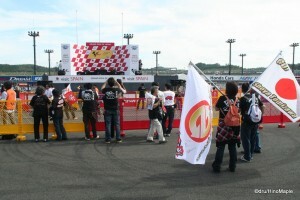 This will be the last time that I attend the Grand Prix of Japan as a Yamaha supporter. I have been with them for 4 years now and have enjoyed every race with them. If you ever have a chance, I highly recommend taking a tour with them. It’s amazing and you won’t be disappointed. Unfortunately, my favourite rider will be switching from Yamaha to Ducati, so that means I can’t support Yamaha while supporting him at the same time. Well, I could, but it would feel a little weird. I will probably return to the first grandstand that I ever sat in, the 90 degree corner grandstand. It’s probably the best seat I have ever been in at Motegi. Do note that I have only been to two locations. You are close to the track and there is a lot of action all the time. I will also have to figure out how to get there without any help from the tour operators. A tour is one of the easiest ways to get into and out of the race. No need to contend with driving, and I can sleep on the way up or down if need be. It will be a great new experience, and you’ll be able to read about it here next year. This entry was posted in Motorsports and tagged 2010 Grand Prix of Japan, Grand Prix, Grand Prix of Japan, japan, Japan GP, Japanese Grand Prix, Motegi, Motegi Town, Motegi Twin Ring, Moto GP, MotoGP, Motorcycle, tokyo, Twin Ring, Twin Ring Motegi, ツインリング, 日本, 東京, 茂木 by Dru. Bookmark the permalink. Sounds like a great trip, I’m hoping to do the same this year. How do you get in the Yamaha section, do you have to apply somewhere? I used to use the Yamaha Travel company. They offer limited motorsports and possibly music related tours. Each year they have a tour to Twin Ring Motegi for the race. You get some cool swag with the tour too. Tours leave Tokyo or Shinjuku Station and you are almost guaranteed a prize. Small gift packs of a hat and flag are almost guaranteed. They used to offer a towel and shirt, but with the bad economy, they are doing less and less. Check out the site if you’d like but it’s only in Japanese. Thanks for the post! I’m trying to pick seats now, and I agree the 90 degree corner looks better than the straight. Only thing is, are there any TV screens visible from there?? If you are going to the Z stands, then there is a TV behind the G stands. If you want to be on the inside of the corner, you won’t have a TV. The TV is actually just a truck, so it is a little small, but big enough. If you get A stand tickets, the screen is actually pretty small as it is pretty far away.